I picked the guys up at their dock at 6:25 then went to catch bait. I made about a dozen throws and put 70 pretty baits in the tank. Boat traffic was busy where I wanted to fish so we made about a 4 mile run and set out a spread of planner boards pulling a flat with deep water nearby. Once we got up on the flat with our spread we started taking hits but the fish were out in the deeper water nearby the breaks. We worked the area for about 2 hour until too many boats had run over the flat so we made a move. We went and filled the tank up again with bait then setup another spread of boards. We worked for about a mile before we started taking hits again. For the next 4 hours we would have plenty of action catching some nice Stripers. Tim caught the two largest fish of the day, both about 10 pounds. Today we took about 35 hits. The water temperature is about 22 degrees colder this year than it was this time last year. 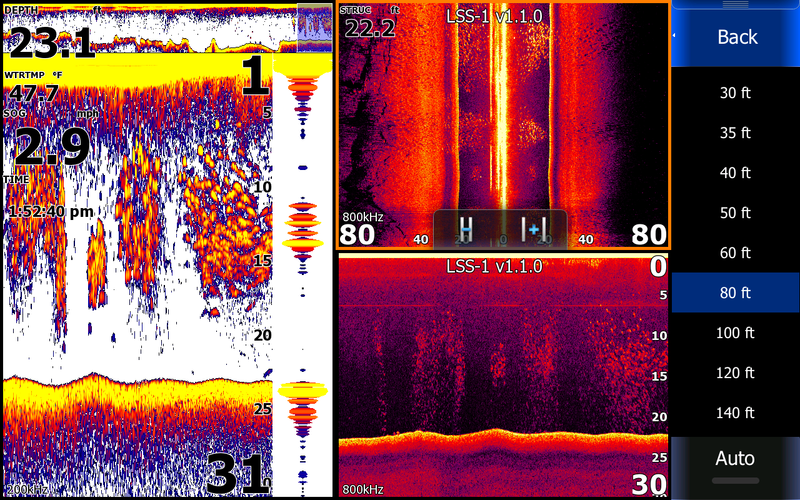 Here are a few pictures that I took off of my new Lowrance HDS-12 unit. In the top picture I was graphing a 10 foot flat and then pulled off of the flat to the nearest drop off. Notice the bright yellow on the bottom, that is a hard rock bottom with a couple of rocks right on the top of the break. That is a contact point for that particular flat. 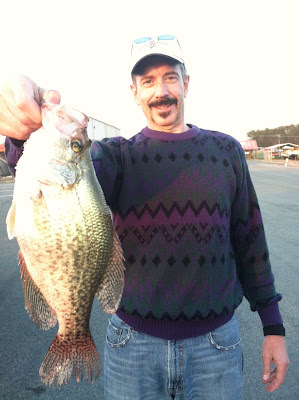 The cloud hanging on the point is a school of nice crappie. Bass, Stripers and Crappie use contact points on flats to congregate before they move up on the flat and disperse to feed and they also get back together after feeding and school up on a contact point before moving back out over deeper water where they usually suspend. When I am looking for fish and don't find them deep or on the ledges or contact points I will not look up on the flat and spook the fish, instead I will shut my big motor down and immediately put out a spread of boards. In the second picture I am graphing a 20 to 25 foot flat marking Stripers [on the bottom left] then seeing the smaller Gizzard Shad prior to going up on the break. At the very top of my screen is my history, about 2 to 300 yards of graphing. As you can see, I had been going over numerous single and double fish relating close to the bottom. The Stripers are the larger arches. The third screen is actually 2 screens, the left screen is bottom lock showing 2,4,6,8,and 10 feet up off the bottom. 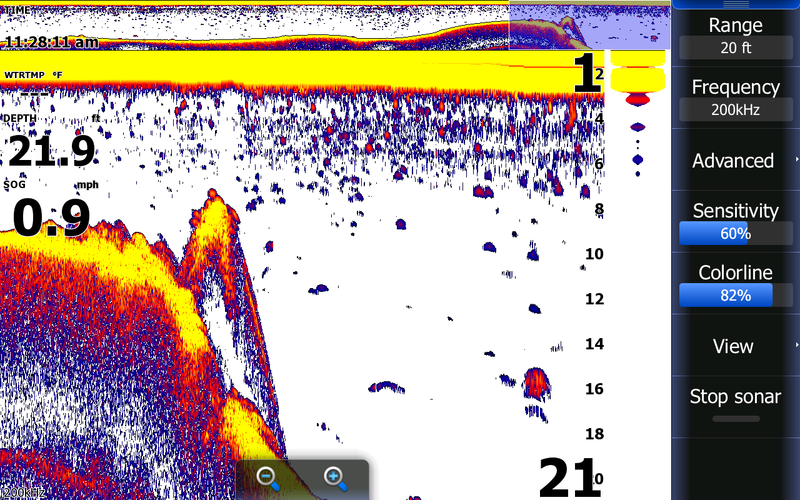 The right side of the screen is traditional sonar. The Stripers were positioned very near a break. The fourth screen is sonar on the left, side scan upper right and down scan bottom right. 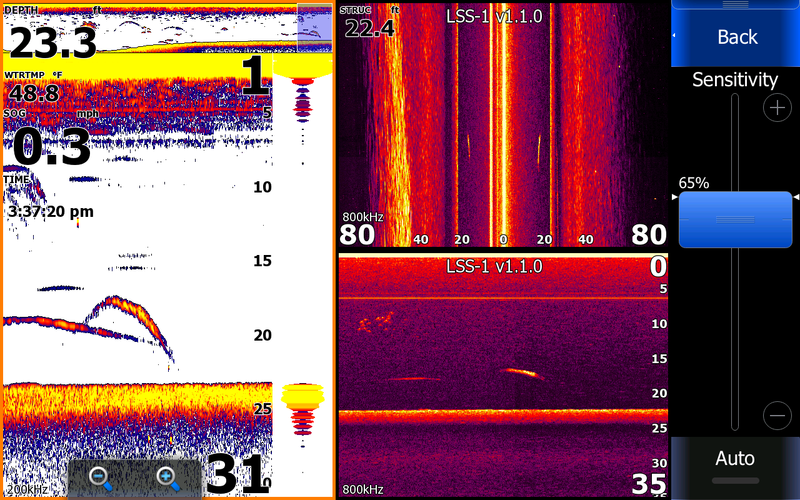 The sonar and bottom scan are clearly showing Stripers from 9 to 14 feet. Side Scan shows a couple Stripers out 40 to 60 feet to the right side of the boat. 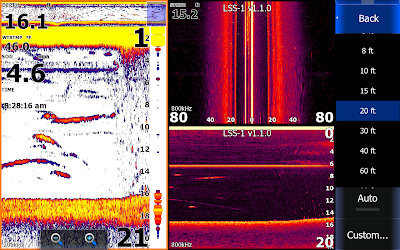 Notice on my sonar page up on the top of the page in history that I had been going over a lot of bait then after the bait stopped I started marking numerous Stripers. I was traveling 4.6 mph while taking that picture. 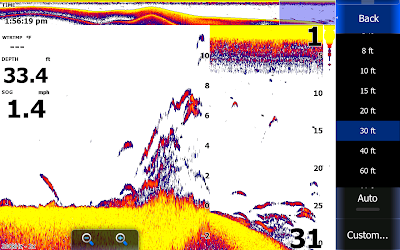 You can also see on my down scan the Stripers quit marking then the bait reappearing. I regularly take out anglers who need help learning their units and not only instruct them on how to use them but show them how to put fish in the boat. The next 4 months are great months to fish for Stripers on the Lake. Book a trip and learn more in a day fishing with me than, well, you decide. Cloudy, Windy and Cold, Water temperature 46*. Today did not start out very well. It was 24* this morning when I left the house. I attempted to roll my window down but it was still frozen solid. Well the glass separated from the track and broke the window. Before I got to the marina Blaine called me and said they had a flat on 95 and would be late. Unfortunately we did not get out till around 8 so we caught bait and set a spread of boards out. The water temp had fallen again with the cold weather and snow and had dropped to 45.2*. We were in for a repeat of last Saturday when the temp dropped 5*. We fished for about 3 hours without the fish being aggressive. The wind was howling and it was cold. The water temp only rose a degree and a half up to 46.8 but that was enough to put the fish on the bank. We made a pass on a clay bank and had 3 or 4 fish hook up. I turned the boat around to try to hit it again but my trolling motor batteries [4 of them] were tired of fighting the wind and made it difficult to control the boat. We worked the same pattern for a couple hours then got blow off the lake. Blaine is pictured holding one of the two Bass he caught today. The fish inhaled the bait so deep he swallowed all of the hooks and died so we kept her. We were able to release his other Bass unharmed. Anthony took Kurt out on Saturday to teach him how to use a Lowrance and also how to catch Stripers on Lake Anna. They caught 9 Stripers and kept these 5 fat fish to take home for the table. They only wanted to keep 4 but the fifth fish swallowed the hook and would not survive. Oh, what a day. We got out yesterday morning, air temp 24* and water temp around 45*. We took about an hour to catch 70 baits then went fishing. After about an hour of fishing I knew we were in trouble. We had about 4 or 5 short hits and caught one fish which was right at 20 inches so we threw it back.There were a few boats in the area and I was limited to where I could fish. I decided to make a move so we threw away the 24 baits we had on our lines and went to catch more bait. We made a couple casts and filled the tank up with beautiful baits. We set out a spread in an area where we could not see another boat for a mile. After pulling a half a mile we had not taken a strike. I had 3 other friends and guides out that I had been talking with that were experiencing the same thing. We finally started taking hits on subtle points right up on the bank. For the next 3 hours we would take hits boating about a quarter of the fish. About noon our problems started . Bass boats started cutting us off, the wind picked up a little and other Striper fisherman started dogging us so we could not turn around and hit productive areas. After 45 minutes without a fish I decided to make one final move to an area where I knew there were fish. The move paid off, we hooked up with 5 or 6 fish in a hundred yard stretch. I turned back and hit the same bank taking another half dozen hits right up on the bank in about a hundred yard stretch. Throughout the morning I kept telling the guys that the extremely cold nights had turned the fish off but once it warmed up in the afternoon they would eat. Our patience paid off and we probably would still be out there catching Stripers if it wasn't for an discourteous Striper fisherman. He watched us catching Stripers on the bank and had the nerve to go between us and the bank right where we had been fishing for over an hour spooking the fish. I had to move out of his way so my boards would not go under his boat.We ended up having well over 40 strikes today and keeping 14 Stripers for the guys to take home. It was a long tough day but we hung in there and made it work for us. Saturday on a 6 inch Gizzard Shad along with some nice Stripers. Guide DP went fishing for a couple hours yesterday evening and caught this nice stringer of Stripers. 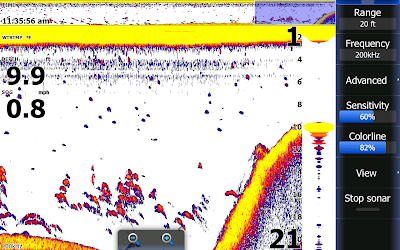 Here are a couple pictures from my new Lowrance. Click on the pics too enlarge. Both shots are showing the unit set up with 3 screens. 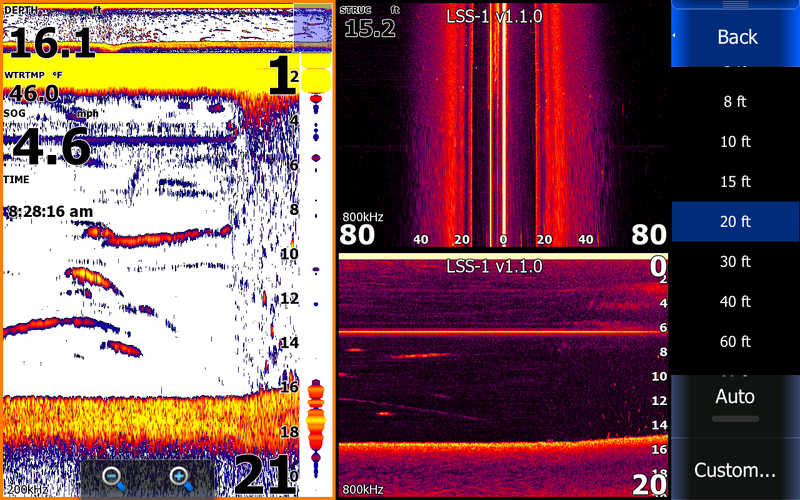 The left screen in the top picture is traditional sonar set in a 31 foot scale showing the bottom of the lake at 23 feet deep, two Stripers around 20 feet, a small bait pod at 10 feet, surface clutter from 1 to 5 feet, then my history above on the very top or the page. Note in the history single fish showing up 200 to 300 yards back. 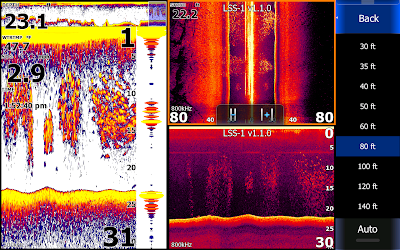 Also in the top pic on the upper right side is side scan set at 80 feet either side with the Stripers showing up as vertical lines and the bottom right screen is down scan also showing the school of bait at 10 feet and the Stripers below them. The bottom screen shot is a little more active. I am traveling at 2.9 mph and Gizzard Shad are everywhere in major schools. These baits range from 7 to 12 inches long. The side scan also shows the baits well and in the far left side out about 70 feet is the channel ledge. The down scan shot shows the bait as well. The bottom shot was taken at 1:52 pm on Wednesday, 2 hours after a major front blew through. The front had pushed the bait from being scattered earlier in the day to positioning itself right over the channel. I drove through well over 200 yards of nothing but bait. This is usually a bad sign for Striper fishing, when the bait and fish are positioned over the channel they are not feeding. Wow, what a day. I picked my clients up at High Point then went to catch bait. The lake was glass, the ski was bluebird, and expectations high. I went to where I had caught bait the last 3 days and there was none. I kept looking till I found some scattered bait then threw about 20 times to fill the tank up. I set up in an area where I had caught a couple fish earlier in the week and worked about a mile stretch catching a few fish. By 9:30 the wind started to blow and clouds rolled in. By 11 the wind changed direction blowing out of the North dropping the air temperature 10 degrees. White caps were everywhere on the lake and squalls were blowing just North and South of us. Needless to say it did not look good. I looked for about 45 minutes to find a place to catch fish using the pattern that I was on that would be out of the wind but there was no such place on the lake. I decided to fish a couple areas I knew fish were in regardless of the wind. Many times today the wind would spin my boat around so I had to resort to using not only my trolling motor to help steer the boat but also my big motor to push us into the wind. I had my hands full putting baits out, retying lines that got fouled with other lines, netting fish, running to the helm to run the big motor and trying to steer through gusts with hopes of keeping the boat on somewhat of a course. All the hard work paid off, we ended up catching 22 Stripers today despite the weather. Jordan is pictured holding up the big fish of the day, a 12 pounder. Anthony called me yesterday around 11 saying he had just got back from Florida and that he wanted to take his boat out for a couple hours fishing and did I want to go. We had gone to Florida last week and I returned early to take care of my house in the snow storm. Anthony wanted to get out on the water and relax before going back to work today to face the storm of issues he may have after not being there for 10 days. Come to find out everything had gone well at work for him and he worried for naught. Well I met him on the water around 12:30. We only had a couple hours to fish because he had to get off the water at 3. We decided to set up in an area where we could pull shallow flats and if the fish were not there simply pull out and hit 20 to 30 foot flats giving us a chance to pattern the fish. It was cloudy yesterday and the fish were basically scattered. We took hits in all depths catching decent fish everywhere. We were using small baits pulling planner boards and downlines. We caught 7 Stripers, a Largemouth and a few Crappie in 2 1/2 hours of fishing. I kept the Crappie for a good dinner last night. My new Lowrance came in yesterday afternoon so I decided to hook it up this morning and take it for a test drive. My grandson Michael was down for the weekend and was dying to go fishing so we mounted the Lowrance and went to the lake around lunch time. My goal today was to get use to the Lowrance then if we had time to take Mike fishing. We worked [and played] with the depth finder for about 2 hours then we went and caught bait. I put out a spread of planner boards and downlines pulling 20 to 30 foot flats and before we knew it we hooked up with 3 at once. Mike wrestled them to the boat and I netted the fish. I left that area because I wanted to take some clients to it this week and moved to a similar area on the lake to see if I could establish a pattern. We put out the same spread of baits and had the same results. We caught 11 Stripers and kept 8 to bring home and fillet. We motored back to where we launched the boat, popped a picture and got home in time enough to clean our catch for dinner. I love my new Lowrance and Michael loved spending an afternoon on the water. 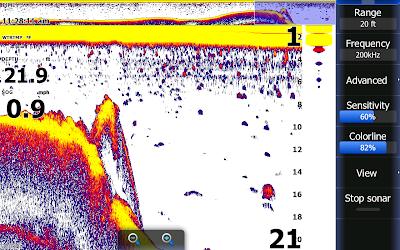 I feel sorry for the Stripers this year, they don't stand a chance with this new Lowrance technology. Guide Brian took these guys out Tuesday before the storm hit fishing for Stripers. They caught 10 fish, 1, Bass, 8 keeper Stripers and 1punk Striper. Although fishing conditions were poor Brian hit numerous places catching a fish here and there to make a successful trip for his clients. The weather is going to break next week and the Stripers should enjoy the warmer weather.